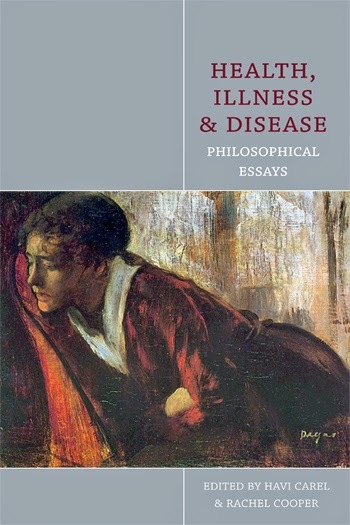 In this post, the new book Health, Illness and Disease: Philosophical Essays (Acumen 2013) is presented by its two editors, Rachel Cooper (Lancaster University) and Havi Carel (University of Bristol). Much effort goes into keeping us healthy. We are regularly told we should drink less, use condoms, and eat more fruit. Sometimes, we comply. All agree that health matters, but figuring out exactly what counts as ill-health remains tricky. Conditions such as cancer and tuberculosis stand out as being fairly clear-cut cases of disease. But increasingly we seek treatment for conditions other than those that straightforwardly lead to suffering and death. We worry about “risk factors” - nebulous conditions that might, at least for some, be linked to future ill-health. The disease status of those with aches, pains and fatigue has always been contested, but in an era of both economic and legal protection for those with “bona fide” disorders, and also increased surveillance of spending on health, they have been rendered newly problematic. The rise of disability rights movements has also led to many questioning whether certain states are pathological, or merely testament to the normal variety of human life. Thus we find ourselves at an odd point in history. Seeking health acts as a motivating force as never before; the percentage of wealth spent on health care continuously increases. At the same time the concepts of health, illness and disease have become problematic in ways that are unprecedented. In this context there is much work for philosophers of medicine to do. The essays in this collection consider concepts of health, disease and illness. In selecting pieces we have sought work that addresses three points that to date have been inadequately addressed by philosophers. First, how can debates about concepts of health and disease be sensitive to the diversity of health problems? Too much philosophy of medicine has been written on the assumption that the primary aim of medical care is to deal with the acute disorders of otherwise healthy young adults. The tacit assumption in such work is that a disease afflicts a patient, interferes with their life for some time, and then, with luck and medical care, goes away. Many of the pieces in this collection address the problems caused by conditions that do not fit this model, such as risk factors, subjective symptoms, chronic conditions, and birth abnormalities. Second, we have included chapters that consider the phenomenology of illness. They consider the person experiencing illness and how best to philosophically describe the experience of illness, which is universal (at least in the sense that almost all human beings experience illness at some point) and often life-changing. Third, we have sought out work that is sensitive to the evidence that notions of health, illness and disease have changed over time in response to shifting social pressures. Reviews of the book can be found in the British Journal for Philosophy of Science, and Metapsychology Online. Rachel Cooper and Havi Carel are grateful to the UK Arts and Humanities Research Council who funded the conference that led to this edited volume, as part of a funded project on The Concepts of Health, Illness and Disease.